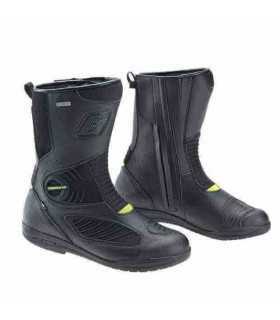 Alpinestars Toucan GORE-TEX ® boots touring Enduro, technical and rugged perfect for long days on the bike. Waterproof and breathable at 100% thanks to the inner membrane of GORE-TEX ®. Safety features - A fully CE-certified boot incorporating full leather and suede with a 100% waterproof GORE-TEX membrane. - Innovative lateral ankle protection system forms flexible link between upper boot and lower foot area for added control and support. - Medial side structure is contoured for perfect fit and flexibility fit, with reinforced polymer sculpturing for grip and protection against bike's heat and impact. - Advanced TPU protection layer covers the internal heel counter and toe box enhancing support and rigidity in key impact areas. 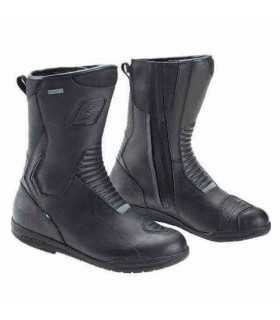 - Coated leather panel forms the outer surface of the toe box providing effective abrasion and weather resistance. - Heel housed in molded external protector for increased impact dissipation and absorption. - Contoured polymer shin guard incorporates an innovative vertical blade system for improved forward and rear control and support. Construction - Advanced instep and Achilles' accordion flex zones for superior comfort, control and support. - Medial surface stamped calf suede panel improves grip and protection. - Wide-entry aperture for convenience with combined hard polymer and Velcro closure to allow wide range of calf fit adjustments. - Closure system features aluminum buckles (replaceable) for security with memory adjustments and quick-release locking system. 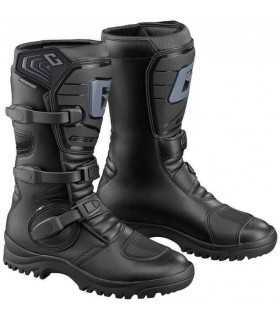 - Upper boot collar and inner lining constructed from breathable mesh for added comfort. - Removable anatomically profiled EVA foam footbed. - Alpinestars exclusive rubber compound for the optimal combination of comfort and grip. - Sole construction features integrated steel shank for improved comfort and durability. - Lateral side vent for added airflow.